Autumn is gardening season. That statement may not seem right to those who think of the spring as the peak time to care for lawns and gardens. However, autumn is an ideal time to get into the garden and ensure that flowers, trees and garden beds will over-winter successfully. A number of things make autumn a prime gardening season. The cooler days of fall enable gardeners to spend ample time outdoors without the threat of blazing heat. In addition, soil harbors a lot of residual warmth in autumn. Also, the colder temperatures haven’t yet arrived in autumn, nor have the leaves completely fallen, making fall a prime time to assess what’s already in the landscape, what needs pruning back and where to address planting for next year. 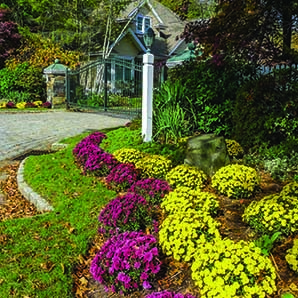 Gardening enthusiasts can focus their attention on these areas this fall. • Pamper perennials. As annuals and perennials start to fall back, mark the spots where perennials are located so they can be easily identified later on. This way, when planning spots for spring bulbs or other spring layouts for next year, perennials won’t be overlooked or covered over. • Prune shrubs. Look at shrubs and trees and cut out dead or diseased wood. • Clean up borders. Weed and tidy up borders and lawn edging. • Install pavers or rock wall. Embrace the cooler temperatures to work on labor-intensive projects, such as putting in a garden bed, retaining wall or walkway. • Remove spent summer veggies. Take out vegetable garden plants that have already bloomed and borne fruit. Tidy up vegetable gardens and start to sow cooler weather plants, such as onions, garlic, beans, and sweet peas. • Rake and compost. Rake the leaves and gather grass clippings to add to the compost pile. • Plant spring bulbs. Get tulips and other spring bulbs ready for planting so they’ll burst with color next year. • Dig up herbs. Relocate herbs like parsley or basil to indoor gardens. Otherwise, strip all leaves and freeze for storage during winter. • Consider mums. Chrysanthemum plants are perennials. While they look beautiful in pots, if planted, maintained and winterized, they can bloom every fall. • Fertilize the lawn. Fertilizing in autumn helps ensure grass will stay healthy throughout the winter. • Add mulch and compost to the garden. Replenish spent soil with mulch and compost so garden beds will be revitalized for spring planting. • Prune hedges. Tidy up hedges, as they won’t be growing much more this year. • Clean and store equipment. Clean, sharpen and oil all equipment, storing lawn and garden tools properly so they are ready for spring and not lying out all winter. Autumn may not seem like gardening season, but there are plenty of lawn and garden tasks to tend to during this time of year.